This venerable four-stroke is another of the late John Scarnell's motors from his time at the Fleetwood Club in the 1930s. 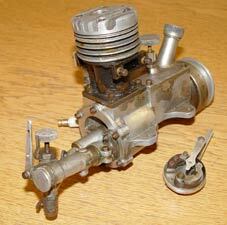 The engine is either 25 or 30cc and could have come from a variety of sources. The same basic design was marketed by Bonds, Gamages, Grays and F.N. Sharp who is credited with the original design. 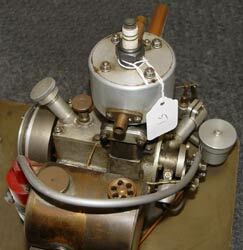 The very long inlet pipe indicates that it is an early version with no carburettor in the accepted sense. The contact breaker mechanism with the arm to advance or retard the ignition is to the left of the motor. 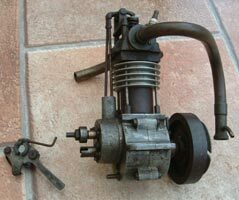 From the end of the 1940s right through to the late 60s, the 'A' Class was the province of home built 30cc two stroke motors. Most of these were cast up at the builders homes, although some such as Norman Hodges' Tiger 30 and Mr Swanson's Saturn 30 were supplied in kit form. There is no way of knowing just how many different 30s there were, but they were all essentially scaled up McCoys. This one was built by Len Lara of the Victoria Club and at some stage blew apart. His son Norman passed the welded case on, along with a bag of assorted bits that included most of the missing engine parts. Ron Hankins did a super job of rebuilding the motor, which now resides in the late Ernie Clark's recently restored, twin hulled boat. Just visible through the exhaust ports are the four tiny transfer valves opened as the piston descends. The pistons also controlled the more conventional sideport carburation. The cylinder on this motor with two inlet ports and the transfer between looks familiar and the whole air of the top half of the motor gives the impression of age. The crankcase might well be a later modification. The use of multiple venturis was well established, both in models and full sized motors, such as the Villiers Starmaker. 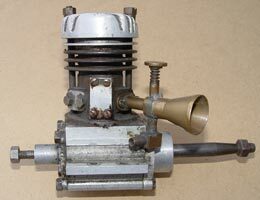 It is a massive engine, yet the capacity is just 12cc with a 14mm plug in a 25mm bore. The brass venturi is quite magnificent considering the tiny intake tube. 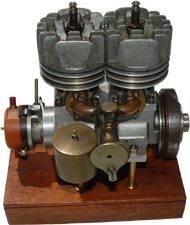 Engines built by the Olivers in Nottingham and in particular, the 'Tiger' twinshaft and derivations, dominated the 1.5cc and 2.5cc classes for many years. Many 'home brewed' copies were put together, either built entirely from scratch or utilising a variety of commercial components. It is not known at present who put this well engineered version together, but certainly, the induction system would not appear to be the normal crankshaft rotary valve. Perhaps careful perusal of photographs in Model Cars or MCN might reveal the builder? It was only after the eBay auction finished that the history of this engine came to light. It was built by John Scarnell who started racing with the Fleetwood Club around 1931 along with Charles Booth. 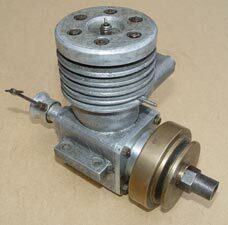 In the late 40s John built a series of two stroke motors, one for each of the classes. 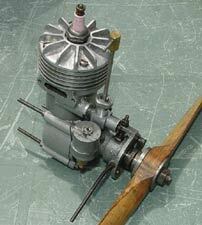 Most of the 30cc motors built at the time were enlarged versions of the McCoy, but his motor has the distinctive 'Bulge bypass' of a Dooling. With generous bearing surfaces and solid construction, there is no reason to suppose that this motor would not run quite happily in a period hull. 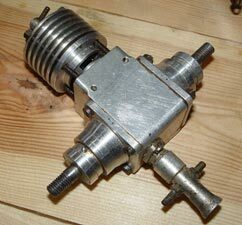 Available from the Model Aircraft Stores in Bournemouth from 1946, this 10cc engine was 'guaranteed', although what for or against was not explained. It was claimed that this motor had been 'Specially designed for speedboats and racing cars', although the four extended crankcase bolts for radial mounting would hardly indicate those uses. 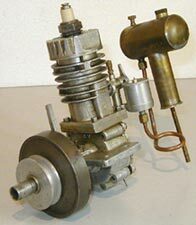 What is obvious and unusual is the forward facing venturi on this sideport motor. It was an engine out of its time, and at a cost of £10-10 it was hardly cheap, and probably not madly powerful either, which may account for its short existence. 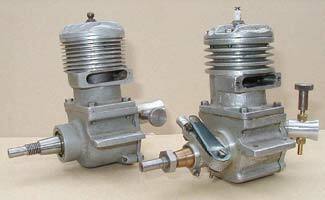 These two lovely 10cc motors were also built by Sid Smith of Chatham around 1948. The spark ignition version on the right is markedly different, apart from the finning. The rotary valve backplate has an angled venturi with an extended shaft, possibly for driving a magneto. the glow model on the left has a straight venturi. There are also other noticeable differences in the crankcase castings. Perhaps Ken Smith will relate the story of these British racing motors at some stage in the future. How he came by them is a fascinating tale on its own. 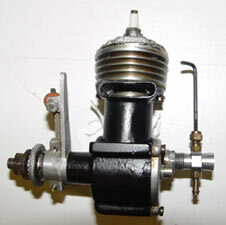 In 1948, Sid Smith of Chatham produced two engines under the ELECTRA name specifically for car racing. The Pioneer 10cc and 5cc were quite different in appearance and only in production for a short while. Both are very rare and the 5cc was at the very top of the wish list for his son Ken, who had restored one some years ago for John Goodall, which was believed at the time to be the only one still in existence. Ken lived in hope that another might still be lurking somewhere. It goes to show that it does pay to travel with hope, as the example shown here turned up at the Walton auction in Nottingham, and happily, Ken had his Pioneer 5 at last. 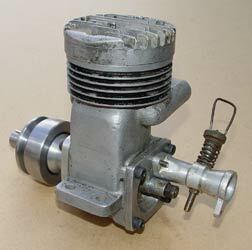 Although it has a water jacket, this 30cc two-stroke motor was designed as a hydroplane engine in the late 30s. The design by W. Cooper of King's Lynn was published in English Mechanics magazine in 1938, hence the name. It was part of a series that started on 1st April for the construction of a metre hydroplane and engine. The hull was designed by R.W. Lance who went to great pains to explain that he had deliberately ignored current practice in the design. This was somewhat obvious as the hull would not looked out of place in the 1920s. The EM 30 has powered a few boats along the way, including those of Norman Dixon and Tom Clements, but at 4 1/2 lbs is no lightweight.